Most irrelevant election in US history comes and goes as long-planned regime change using Al Qaeda death squads against Syria continues unabated. Almost as if to affirm the absolute irrelevance of elections in the “democratic” West, expanded conflict promised by the perceived “hawkish” Republican candidate Mitt Romney is proceeding immediately ahead under the re-elected President Barack Obama. 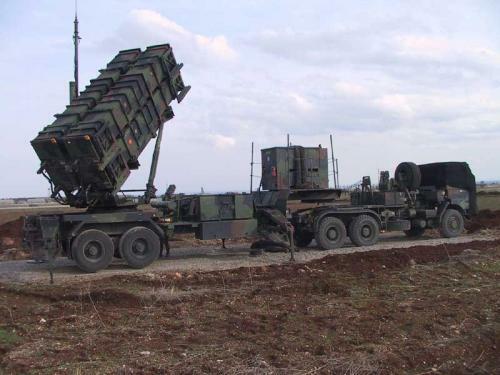 Aside from superficial window dressing via an elaborate array of proxies through which US cash and weapons will flow, more direct military aid, including securing a defacto no-fly zone over parts of northern Syria using US-made Patriot missile batteries is now being discussed. Image: A Patriot missile system. NATO Source Alliance News Blog reported on November 4, 2012, “Turkey plans to officially request NATO deploy a Patriot missile defense system in its territories as a security precaution against a potential large-scale military offensive from Syria as Syrian shelling on the border raises tensions.” Now this request is being re-purposed to enact a defacto “no fly zone” over northern Syria – illustrating the duplicitous nature of reports/initiatives coming out of NATO members as they once again attempt to creep their way toward unwarranted military intervention. The Associated Press (AP) claims in their article titled, “Obama Re-Election Signals New Phase in Syria War,” that “Turkey and allies, including the United States, have discussed the possibility of using Patriot missiles to protect a safe zone inside Syria.” This, it is claimed, would only be implemented with a UN mandate. Such a mandate is unlikely, with Russia and China having obstructed all efforts to justify Libya-style military aggression against Syria. Additional cross-border incidents will most likely be used as a pretext instead. Secretary Clinton Handpicks Client Syrian Regime at Meeting in Despotic Nation of Qatar. Meanwhile US Secretary of State Hillary Clinton is attempting to gestate a newly handpicked proxy regime to pose as the leadership of NATO armed, funded, and directed terrorists currently ravaging Syria within and across its borders. Ironically, this is occurring in Doha, Qatar, one of the most despotic regimes on Earth, and one of a handful of remaining absolute monarchies. UK’s Prime Minister Cries Freedom for Syria, Then Arms Despotic Autocracies to Teeth. UK Prime Minister David Cameron is likewise in the Middle East, pledging tens of millions in cash to foreign terrorists operating inside Syria in an effort to “”shape the opposition” into a coherent force and open channels of communication directly with rebel military commanders,” while making arms deals with certifiably despotic regimes lining the Persian Gulf. Image: A Saudi Typhoon fighter (Wikipedia). 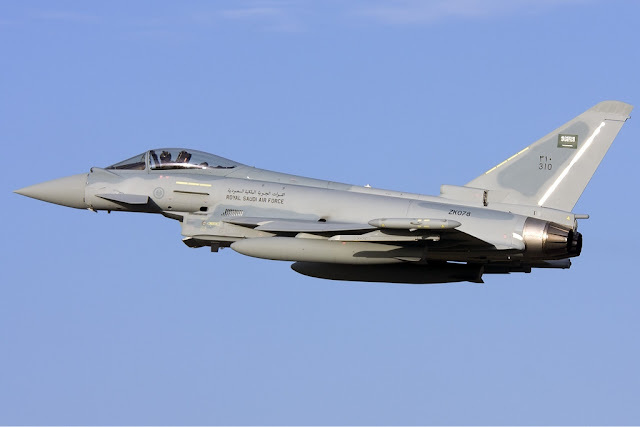 Both the Saudis and the UAE seek additional Typhoon aircraft as part of astronomically large weapons deals being made with the West as of late. The hypocrisy of arming terrorists for “freedom” in Syria, while the West arms regimes like the Saudis currently slaughtering protesters both at home, and in neighboring Bahrain, has forced even Amnesty International to make a statement, albeit an ineffectual one. “Selling arms to countries like Saudi Arabia and UAE should only be considered if there are absolutely watertight guarantees over them not being used to commit human rights violations. “Saudi Arabia has been the recipient of record-breaking arms deals involving the UK, yet these have been highly secretive and there’s been little or no follow-up over how the weaponry was used. “For example, in 2009 the Saudi air force used UK-supplied Tornado fighter-bombers in attacks in Yemen which killed hundreds – possibly thousands – of civilians. In one attack conducted by Saudi forces on the town of al-Nadir in November 2009, so many were killed in just one extended family that witnesses say the family ‘had to create a cemetery for themselves’. “More than two years ago we called for the UK government to urgently investigate Saudi Arabia’s involvement in this episode and meanwhile suspend any further arms supplies to Saudi Arabia. Saudi Arabia, US, and Israel had Planned Overthrow of Syria via Al Qaeda Since 2007. Saudi Arabia, of course, is using their weapons and cash flow from the West to not only to brutalize their own people, but to seed the Muslim World with madrases designed to indoctrinate an army of sectarian extremists, arm and fund them, and use them across the Muslim World to execute Western and Saudi foreign policy. The very same networks used by the US and Saudi Arabia to flood Afghanistan in the 1980’s with militants to fight the Soviets, and again during the US-British occupation of Iraq and Afghanistan, are now being used to flood Syria with foreign terrorists. It was exposed in “NATO Using Al Qaeda Rat Lines to Flood Syria With Foreign Terrorists,” that indeed, the very networks used by Al Qaeda to flood Iraq with foreign fighters is now being used by the United States, NATO and the Persian Gulf States of Saudi Arabia and Qatar to violently overthrow Syria. Mitt Romney’s Warmongering Promises to be Fulfilled by Reelected President Obama. While Americans, and the world in general, are expected to believe that elections directly affect a nation’s policy, it is clear that foreign policy objectives versus Syria were determined long before President Obama took office, and have continued despite whatever alleged political ideology he supposedly adheres to. While many may be disappointed by the loss of Republican presidential candidate Mitt Romney, within hours of President Obama’s reelection, already a pledge made by Romney is being fulfilled by his opponent.